Depending on the location and accessibility of your hotel, our coach will either stop outside or a guide will walk you to the departure point. Alternatively, join us at our meeting point near Wenceslas Square. In the company of an experienced local guide, we set out to discover the dramatic history of the Old Town and Jewish Quarter in Prague. We explore the medieval streets lined with historic buildings, and pass through magnificent squares, as we learn of the people and events that have shaped the city over the past one thousand years. The tour includes pick up from your hotel by air-conditioned coach to transfer you to the starting point near Wenceslas Square, from where the rest of the tour is on foot. On the tour we visit the cobbled streets in and around the Old Town Square, where remarkably many buildings have survived from the Middle Ages. We explore the Jewish Quarter, once the largest Jewish ghetto in Europe, see its synagogues and the old Jewish cemetery, and learn not only of the torrid events, but also of the wonderful traditions and legends associated with this area. We discover the Estates Theatre, where Mozart performed in 1787; Havel's Market; the Gothic Tyn Church; charming Ungelt, which for centuries was a place for merchants; St. Jacob’s Church, where royal weddings took place; Carolinum, the oldest University in Central Europe; the Powder Tower and Republic Square; and the stunning Art Nouveau Municipal House. Not forgetting of course Wenceslas Square, the former horse market, and an important place for revolution and demonstration. Here we fast forward to the 20th century to imagine the Soviet tanks rolling in, and learn about the Prague Spring and the Velvet Revolution. The Prague Old Town & Jewish Quarter Tour is a terrific introduction to the city. In just 2½ hours participants will gain a good understanding of this fascinating city. 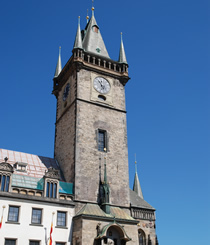 Prague Experience sightseeing tours are in English and another language. They are led by professional, licensed tourist guides and use modern, air-conditioned mini-coaches. If you require a tour in French, German, Italian, Russian or Spanish, please specify on the booking form. The trip finishes in the Old Town. Note: This tour does not include admission to any buildings in the Jewish Quarter. For a more in-depth tour of the Jewish Quarter, including entrance to all monuments in the Jewish Museum in Prague, we recommend our Jewish Quarter Walking Tour.